With their new documentary, Ken Burns and Lynn Novick suggest that we not only do need to talk about the war, especially the terrible divisions it left behind, but that together we can begin to overcome them. In addition to recounting the bloody history of the Vietnam War, their documentary seeks to facilitate a kind of collective therapy, where all sides, Americans and Vietnamese, the North and the South, GIs and antiwar activists, can finally begin to work towards closure. To its credit, the documentary features unseen archival footage, makes an important effort to include Vietnamese voices, and presents an account that is less one-sided than what one would expect from a production sponsored by figures like David H. Koch. But despite its intentions, the overall framing is not only inaccurate, but politically dubious. While some aspects of “The Vietnam War” may challenge the standard pro-American story that is still recycled today, the documentary ultimately reinforces that story, missing an opportunity to raise serious questions about US imperialism. In this way, the closure we get is a superficial one that does not actually bring us closer to ending a war that is in many ways still not over. The rest of the documentary, especially the first few episodes, sets out to justify this claim. The US, we are told, was more or less pushed into this catastrophe, like a clumsy, overly confident, but ultimately well-meaning giant tripping into a hornet’s nest. It is true that probably none of the leading policymakers in Washington wanted the war they eventually got. It’s also true that the story of US involvement in Vietnam was one in which unforeseen developments, internal disagreements, and improvisation played an important part. 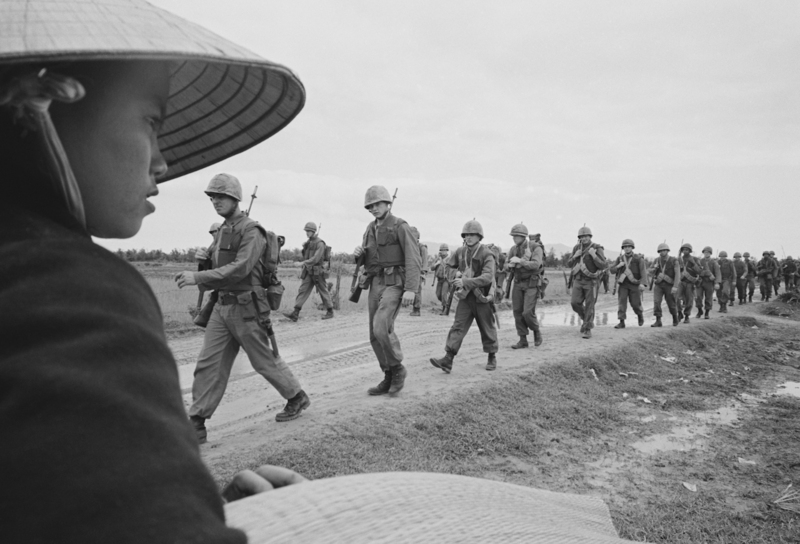 It is even true that the US was very hesitant to involve itself in the conflict playing out in Southeast Asia, and initially expressed serious concerns over France’s attempt to recolonize Vietnam after the Second World War. But for a number of reasons, such as the need to win France’s cooperation in building an anti-communist Europe, a desire to keep Southeast Asia open for Japanese economic development, conservative pressure on President Harry Truman to take an even harder anti-communist stance, and the shock of communist victory in China, the US became deeply involved in the First Indochina War. As Burns and Novick point out, by 1954, the US was paying over 80 percent of the costs of the French war. During the Battle of Dien Bien Phu, President Dwight Eisenhower seriously considered military intervention to save the besieged French, including the use of nuclear weapons against the Viet Minh. To say the war was begun in good faith, by decent people, cannot be further from the truth. While there were certainly many competing visions within the US state, and while US policy was never fully coherent or monolithic, by the 1950s, the US had begun to settle on the outlines of a general imperialist project: ensuring the global reproduction of the capitalist mode of production. This meant keeping European allies in line, making sure newly independent countries did not fall outside the capitalist sphere, and above all, confronting communism. It was this project that led the US to overthrow Iranian Prime Minister Mohammad Mossadegh in 1953, helping to decimate the Iranian left, strengthen a dictatorial monarchy, and fan the flames of anti-American sentiments that would play such an important role in the Islamic revolution of 1979. It was also this project that led the US to overthrow Guatemalan President Jacobo Arbenz the following year, again installing a brutal authoritarian government, fortifying United Fruit’s grip on Guatemala’s economy, and eradicating democratic voices. Burns and Novick do mention both these events in the second episode, but only in a single sentence that does little to explain why the US engineered these coups, and how they fit into the country’s larger aims at this time. This is a major oversight, since these coups were part and parcel of the same imperialist project that motivated US actions in Vietnam. The US made certain that Vietnam would be divided in half at the Geneva Conference that brought the First Indochina War to an end in 1954; that the Southern half would be developed into an anti-communist nation-state where none had ever existed before; and that attempts to hold a referendum to reunify the country, as required by the Geneva Accords, would never take place. As Eisenhower himself explained, if there was to be a nationwide vote, nearly 80 percent of the country would vote to reunify under Ho Chi Minh. This could not be allowed to happen. Other reviews have detailed at length the US commitment to stopping communism in Vietnam, which was pursued particularly by building up a capitalist state in the South. Of course, the US was not always in charge, its plans were not realized in the ways it wanted, and the White House had to make unpalatable compromises with South Vietnamese elites, such as the new, dictatorial leader of the Republic of South Vietnam, Ngo Dinh Diem. But while new scholarship has shown that Diem was not a puppet, Burns and Novick exaggerate his relative autonomy in order to let the US off the hook. To explain the alliance with Diem, the directors turn to Leslie Gelb, a State Department official during the Vietnam War — and a supporter of the Iraq War — who argues that Diem “started to boss us around,” that he was not so much an ally as “our master,” and even that the US was a “victim” of Diem. How the US – the greatest military power in the history of the planet, backed by defense pacts with forty-two states, 2,200 military bases in thirty-three countries, and an arsenal of over 30,000 nuclear warheads in the 1960s — was a victim is unclear, an impossible claim. It’s also unclear how one can square Leslie’s striking characterization of the US with the fact that in 1963, this “victim,” despite considerable internal disagreements at the highest levels, ultimately gave the green light to assassinate Diem because Washington was so fed up with him. Despite the absurdity of this interpretation, Burns and Novick need it to justify their claim that the US always had good intentions but just got swept into something beyond its control. The claim that the US had good intentions becomes harder to sustain the further we travel into the 1960s. On August 4, 1964, radar signals indicated to two US destroyers prowling the Gulf of Tonkin that they were about to come under attack. The ships sounded the alarm, aircraft were dispatched, and guns fired into the night. Looking below, American pilot James Stockdale recalled that he saw nothing but “the black sea and American firepower.” We still don’t know what happened, but one thing is clear: there was no Vietnamese attack. Yet the decent men in Washington, full of good intentions, decided to respond with a retaliatory strike on North Vietnam. What’s more, even though they knew there had been no attack on the American ships, the White House rammed through a resolution in Congress which gave President Lyndon Johnson wide powers to fight communist subversion in Southeast Asia. The resolution, Burns and Novick themselves point out, had been drafted well in advance of the events, and the White House used the incident as a pretext. It passed unanimously in the House, and only two voices dissented in the Senate. In this way, the well-meaning representatives of the American people, so eager to fight communism, made a “fateful miscalculation” that would play its role in taking millions of lives. But this was no miscalculation. Most of the dominant players in the American state were committed to taking out communists, one way or another. To say, as Burns and Novick do, that the US entered the Vietnam War in good faith is to misunderstand the causes of the war, and, worse, to exonerate the US for its grotesque role in demolishing millions of lives. It’s true that some policymakers doubted they could win, including President Johnson, and that the US government did not mastermind everything from the start, had to adapt to unforeseen circumstances, and ultimately found itself trapped in a deadly spiral from which it tried desperately to escape. But this was largely a spiral of its own making, made possible by specific intentions. In recent years, this has begun to change, not only in professional scholarship, but in popular accounts of the war. Burns, but especially Novick, made a conscious effort to incorporate Vietnamese perspectives. Though Americans still drive the narrative, we hear stories from Vietnamese, not only from the Republic of Vietnam, but from those who fought for the North. For Burns and Novick, who are after reconciliation, it is imperative to bring balance to the story. But as other reviewers have pointed out, this is also one of the documentary’s greatest flaws. In their quest for balance, Burns and Novick end up flattening important differences. Sometimes, Burns and Novick will swiftly leap from a specific case of Vietnamese suffering to specific case of American suffering, abruptly bringing the two experiences onto the same plane despite radically different contexts. Through these techniques, history is reduced to decontextualized tropes, allowing Burns and Novick to make ahistorical comparisons to superficially similar things. Both GIs and Vietnamese communists suffered; both the US and the Democratic Republic of Vietnam tortured prisoners; both the American troops and communists killed civilians. In short, both sides felt pain, and both sides inflicted it. Both sides are to blame for the tragedy. While Burns and Novick should be credited for trying to bring balance to what are often incredibly unbalanced histories of the war, the kind of balance they pursue re-inscribes those biased histories. Reducing balance to simply pointing out that both sides engaged in brutality comes dangerously close to Donald Trump’s claim that there was violence “on both sides” in Charlottesville, Virginia. As others have pointed out, this position obscures the reasons why people on different sides engage in violence: Nazis engage in violence because they want to expel, enslave, or eradicate people they deem to be inferior; anti-fascists engage in violence to stop Nazis from achieving those ends. In Vietnam, things were more complicated, as all sides most certainly unleashed tremendous violence. But they did so for different reasons. The US military killed communists in order to prop up an unstable political creation, exterminate communism in Southeast Asia, and make the world safe for its brand of capitalism. Vietnamese communists killed American troops because they saw them as an invading force bent on keeping the country divided, subverting Vietnamese self-determination, and hunting people like themselves down like animals. Burns and Novick’s problematic approach to balance not only erases different motivations, allowing them again to claim that the US had “good intentions”; it also equalizes the unequal scale of violence. The Americans lost a little over 58,000 military personnel, but over 1 million Vietnamese communists, from the South and the North, perished. There were perhaps 3,000 American POWs and MIA by the end of the war, but that number pales in comparison to the over 100,000 political prisoners rotting in the jails of South Vietnam. And while the US dropped more tons of bombs on Vietnam than all the bombs dropped during the entirety of WWII, to my knowledge the Democratic Republic of Vietnam never once tried to bomb the US during the war. At a recent preview of his documentary at the Kennedy Center in Washington, D.C., attended by figures like John McCain and John Kerry, Ken Burns asked everyone in the audience who served in Vietnam to stand up. He then asked everyone who protested the war to rise. Some members of each side then reached over and shook hands. Nothing better captures Burns’s aims with this documentary: bringing all sides together to finally heal the wounds of that war. “It’s really true,” Burns explained. “I think it’s been borne out by the screenings we’ve done all around the country, 50 or 60 different screenings that no matter the audience — conservative, military, liberal, whatever — it’s been this cathartic experience and one that feels potentially healing.” As with his famous documentary on the Civil War, it appears that Burns hopes his new one on the Vietnam War may also bring closure to another of America’s great traumas. But while they may have had the best intentions, Burns and Novick only offer viewers a spurious closure. While the documentary may provide an opportunity to share experiences, bring different sides into dialogue, and discuss the war, it cannot provide any meaningful sense of resolution, reconciliation, or unity. And that’s because the Vietnam War is not really over. It’s not just that the war’s legacies still mark the US, Vietnam, Laos, Cambodia, and many other countries that were pulled into that hecatomb; as Burns and Novick know, the Vietnam War is still killing thousands of people. In the US, tens of thousands of veterans have reported illnesses, some of them life-threatening, which have been tied to their time in Vietnam. Most have to do with herbicides and defoliants, such as Agent Orange, of which the US sprayed over 19 million gallons across 20 percent of Vietnam. If these weapons are killing off Americans, they are certainly doing far worse to those Vietnamese who survived. Reports indicate that the war lived on in the form of miscarriages, premature births, and congenital birth defects. Furthermore, not all US bombs exploded in Southeast Asia. Since the end of the war in 1975, reports George Black, nearly 40,000 Vietnamese had been killed by what are called “unexploded ordnance,” U.X.O. In Laos, the most heavily bombed country per capita in human history, about one-third of the country contains U.X.O., including about 80 million cluster bombs. In other words, the US government is literally still killing people in these countries, with children who mistake the bombs for toys constituting many of the casualties. And even though the war has ended, the US government continues to do very little to clear the explosives they left behind. But the Vietnam War has not ended in still another crucial sense. The state that brought such incredible destruction on what was once French Indochina has continued to wage similar operations throughout the world. In Afghanistan, the US armed the mujahideen. In Central America, President Ronald Reagan backed anti-communist death squads. More recently, the Bush Administration manufactured a horrendous war in Iraq. Under President Barack Obama, the US destabilized Libya. The US is still in Afghanistan, mired in its longest war ever, while President Donald Trump has promised action against Iran, threatened to “totally destroy” North Korea, and intimated some kind of intervention in Venezuela. In this context, to return to Vietnam to see what it can teach us about unity, patriotism, forgiveness, and ultimately reconciliation, as Burns and Novick urge, is questionable at best. Instead of looking to the past for reconciliation, we should search for lessons to help us in the necessary struggle against bigotry, war, and imperialism. Much has changed since Vietnam. The motivations behind US actions in the places mentioned above are different, as are the objectives, the compositions of the ruling classes in power, and the overall historical conjunctures. It would be foolish to see in all these examples the same invariant essence at work. US imperialism has taken many forms, depending on time and place, and it’s imperative that we closely study those changes. But while US imperialism may have changed shape, our commitment to opposing it in all its forms should not. Let’s not forget one of the central messages of antiwar activists in the 1960s and 1970s: ending the Vietnam War is not enough; the goal has to be to organize a mass political movement that can bring an end to the global system that makes such wars possible in the first place. That’s the real closure we all need.